French novelist Marcel Proust was one of the greatest writers of the twentieth century. His books abandoned plot and dramatic action in favor of the narrator's descriptions of his experiences in the world. Marcel Proust was born on July 10, 1871, in Auteuil, a suburb of Paris, France. His parents, Dr. Adrien Proust and Jeanne Weil, were wealthy. Proust was a nervous and frail child. When he was nine years old, his first attack of asthma (a breathing disorder) nearly killed him. In 1882 Proust enrolled in the Lycée Condorcet. Only during his last two years of study there did he distinguish himself as a student. After a year of military service, Proust studied law and then philosophy (the study of the world and man's place in it). Proust became known as a brilliant conversationalist with the ability to mimic others, although some considered him a snob and social climber. 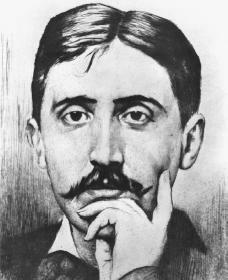 In 1892 and 1893 Proust wrote criticism, sketches, and short stories for the journal Le Banquet and to La Revue blanche. His first work, Les Plaisirs et les jours (Pleasures and Days), a collection of short stories and short verse descriptions of artists and musicians, was published in 1896. Proust had made an attempt at a major work in 1895, but he was unsure of himself and abandoned it in 1899. It appeared in 1952 under the title of Jean Santeuil; from thousands of pages, Bernard de Fallois had organized the novel according to a sketchy plan he found among them. Parts of the novel make little sense, and many passages are from Proust's other works. Some, however, are beautifully written. Jean Santeuil is the biography of a made-up character who struggles to follow his artistic calling. After abandoning Jean Santeuil, Proust returned to his studies, reading widely in other literatures. During 1899 he became interested in the works of the English critic John Ruskin (1819–1900), and after Ruskin's death the next year, Proust published an article that established him as a Ruskin scholar. Proust wrote several more articles on Ruskin, and with the help of an English-speaking friend, Marie Nordlinger, and his mother, Proust translated into French Ruskin's The Bible of Amiens (1904) and Sesame and Lilies (1906). Reading Ruskin's ideas on art helped him form his own ideas and move beyond the problems of Jean Santeuil. In 1903 Proust's father died. The death of his mother two years later forced Proust into a sanatorium (an institution for rest and recovery), but he stayed less than two months. He emerged once again into society and into print after two years with a series of articles published in Le Figaro during 1907 and 1908. By November 1908 Proust was planning his Contre Sainte-Beuve (published in 1954; On Art and Literature). He finished it during the summer of 1909 and immediately started work on his great novel. Although Proust had by 1909 gathered most of the material that became À la recherche du temps perdu (Remembrance of Things Past), he still felt unable to structure the material. In January 1909 the combination of flavors in a cup of tea and toast brought him sensations that reminded him of his youth in his grandfather's garden. These feelings revealed the hidden self that Proust had spoken of in Contre Sainte-Beuve, and he felt that the process of artistic rebirth was the theme his novel required. In À la recherche du temps perdu Proust was mainly concerned with describing not real life but his narrator Marcel's view of it. Marcel traces his growth through a number of remembered experiences and realizes that these experiences reflect his inner life more truly than does his outer life. Proust began his novel in 1909 and worked on it until his death. In 1913 he found a publisher who would produce, at the author's expense, the first of three projected volumes Du Côté de chez Swann (Swann's Way). French writer André Gide (1869–1951) in 1916 obtained the rights to publish the rest of the volumes. À l'ombre des jeunes filles en fleur (Within a Budding Grove), originally a chapter title, appeared in 1918 as the second volume and won the Goncourt Prize. As other volumes appeared, Proust expanded his material, adding long sections just before publication. Feeling his end approaching, Proust finished drafting his novel and began revising and correcting proofs. On November 18, 1922, Proust died of bronchitis and pneumonia (diseases of the lungs) contracted after a series of asthma attacks. The final volumes of his novel appeared under the direction of his brother Robert. Brée, Germaine. The World of Marcel Proust. Boston: Houghton, Mifflin, 1966. Carter, William C. Marcel Proust: A Life. New Haven, CT: Yale University Press, 2000. Cocking, J. M. Proust. New Haven, CT: Yale University Press, 1956. Painter, George D. Proust. Boston: Little, Brown, 1959–1965. White, Edmund. Marcel Proust. New York: Viking, 1999.